Get up, get out, and do something! Just about any day of the year you can find something fun, informative, and healthy to enjoy at an area park or our Recreation Center. Kernersville Parks & Recreation offers a year-round schedule of programs and activities for all ages and abilities. Exciting things are happening in our parks every day! We host, produce, and present a variety of special events throughout the year ranging from free community festivals to films under the stars. If you are looking for family-friendly events, programs, athletics or volunteer opportunities, check our calendar of events and set a date with Kernersville Parks and Recreation! If you want to get our news on a regular basis, sign up for our R.E.A.L. (Recreation Event Announcement List) or follow us on Facebook. Also, be on the lookout for our new Winter Leisure Guide coming out at the end of December. There is something for everyone. For a full list of our programs and athletics, visit www.kvparks.com. Don’t forget to mark your calendars for an “Enchanted Evening” at our annual Father Daughter Dance. Be prepared to enter into an Enchanted Forest where we will welcome fairies and magical creatures alike. Don your fanciest attire and whisk your princess off for a magical night of dancing, food, and fun! We wanted to create an endearing memory for fathers and daughters to cherish and provide an opportunity for fathers to show respect for their sweet girls, while having a blast together. Dads have as much fun as the girls do! Tickets go on sale Thursday, January 3rd and will sell out fast. There will be no sales at the door, so make sure you reserve your spot quickly. The dance will be held at First Christian Church. Kernersville is embracing the Hispanic Culture that surrounds us every day! This vibrant celebration is a free festival featuring authentic Latino music, food, dancing, and games. Immerse yourself in culture as we come together for a fun day in the park. Treat your senses to wonderful sights, sounds, and tastes. As a parent, you want the best for your child – here is another way of putting it: you want to provide opportunities for your child that matter. Opportunities that can make a positive difference in his or her life. So, if you are considering summer day camp for your child, it is reasonable to want to know why the program matters. If you grew up going to camp every summer, you are likely well aware of the benefits those summer experiences provided you. But if you did not, you may not realize the impact summer camp can have on the developing minds of your children. In addition to providing parents with a childcare option over the summer months, camps can help children with both short-term and long-term development. Jump into Summer with KPRD’s Summer Camp! Full-day, weekly camps for ages 6-12 years old. Daily excursions to local parks, crafts, swimming, field trips, and fun! What better way to enjoy a summer evening than to spread out a blanket and see an outdoor movie? Join us throughout the summer months for a few newly released flicks for free! There is not a bad seat in the park with our large screen, so grab your lawn chairs, get the kids together, and pack a few snacks for a movie under the stars. Arrive early for food trucks, games, and prizes. Movies will be chosen in February and listed on our website. Bring your lawn chair, blanket, family, and friends to the Kernersville Raiders football field for a FREE fireworks celebration–complete with live music starting at 6:30pm. The sky will light up around 9pm for a spectacular display of our great nation’s independence. Fourth of July Park is the place to “bee” for a FREE festival of music, authentic crafts, food trucks, and kids activities. Mary’s Family Fun Hive will feature several different carnival-type rides for kids of all ages to enjoy. Our main stage will have several class acts perform throughout the day. There will also be face painting, games, blacksmiths, a live bee hive, on site demos, and of course – HONEY! Registration for vendors will open March 1, and accepted on a first come, first serve format. Participation is not guaranteed. Applications will be available at www.kvhoneybee.com. All ages are invited to walk or run the exciting 5K or 1-mile course starting at Fourth of July Park, promoting health and fitness while having fun and enjoying the sights and sounds of fall. Participants are encouraged to come in costume for this festive event. The annual Pumpkin Run features live entertainment, kid’s activities, and costume contest for adults, children, and dogs– with Prizes and Pumpkins! Registration begins in mid-August, so be on the lookout for the Early Bird Specials. Watch the streets of downtown Kernersville become a Halloween Haven! We will have trick-or-treating at local downtown businesses and we will have ghoulish fun, music, and more from 6pm – 8pm. 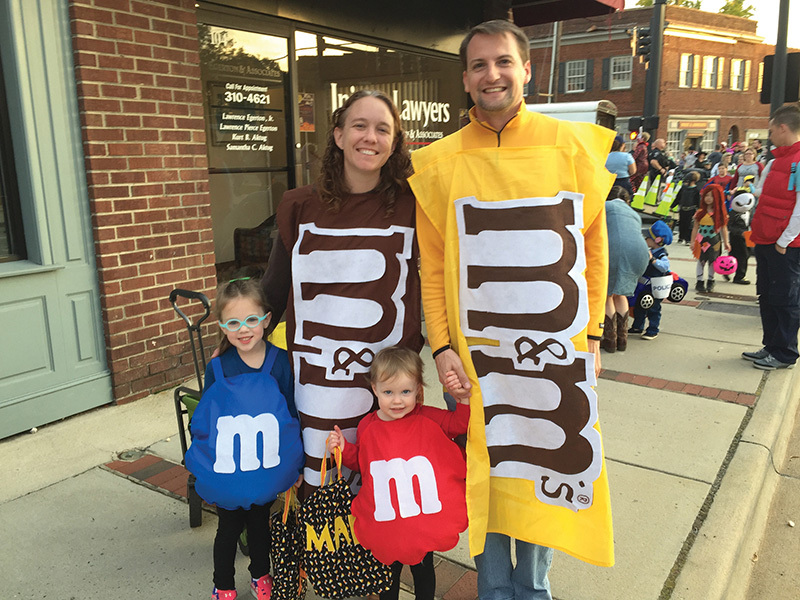 The Downtown Trick-or-Treat is a public service provided by downtown merchants, Kernersville Parks & Recreation, Kernersville Police Departments, and the Kernersville Chamber of Commerce. Downtown Trick-or-Treat is an alternative to door-to-door trick-or-treating for families. This is a free event and a great way for merchants and the community to come together in a safe environment. This festive, family-friendly event welcomes guests and the community to sing carols, drink hot cocoa by the fire, and countdown to the exciting tree lighting. Follow Santa, Mrs. Claus, and friends as they ride in a horse-drawn carriage to the park. Don’t miss this holiday tradition in Harmon Park!